I did it again. I bought another sugar crystal/toffee chocolate. This time it's part of my "second look" at Green & Black's. As I mentioned before, I've probably reviewed all of the bars from Green & Black's at some point--but it's been years, so I've mostly forgotten what their chocolate is like. 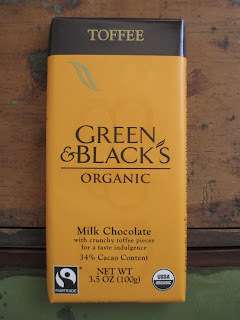 This is me starting over with Green & Black's, today with their Toffee Milk Chocolate. I have nothing more to say about the familiar packaging for now; let's move on to the chocolate. I was surprised to find the chocolate's aroma generic. It has that typical sweet, caramel milk chocolate aroma, which is nice enough but not singular. The implication is also more of confection-style chocolate. Though the toffee isn't visible from either the front or back of the car, the fairly big little bits of toffee are visible once you break off a piece from the whole. (Forgive the melty look in the picture; it's summer.) 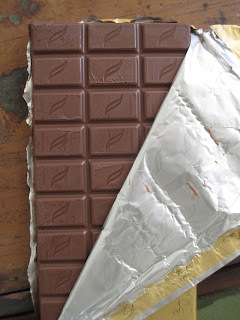 The first taste of this chocolate is simply sweet; the caramel and vanilla notes come in next, then a touch of earthy richness along with more vanilla. After having all of these chocolates lately with sugar crystals and crunchy caramel pieces, it's pleasant to come back to actual toffee. There is a difference: toffee has a more specific crunch and more of a glassy flavor. The proportion of toffee in the chocolate is balanced. I do like toffee, so this chocolate bar is nice. I'm enjoying eating it. But it's probably easy to see that I'm somewhat disappointed. The chocolate is pretty standard--above the candy bar level, certainly, but I had expected more. This is indeed what I would categorize as confectionery, and not simply because there is toffee involved. The only problem with that, if it is a problem, is that I didn't think of Green & Black's as making confectionery chocolate. This is indeed a casual, sweet bar of organic, fair trade chocolate that's great for when you're craving sweet chocolate, not fancy artisan dark chocolate full of flavor notes. But the simple packaging implies that this is sleek and refined chocolate. Maybe Green & Black's lets you fill in the style. Maybe they have such a generic packaging because they don't want to imply anything about their product. Their main selling point has always been their organic, fair trade status. 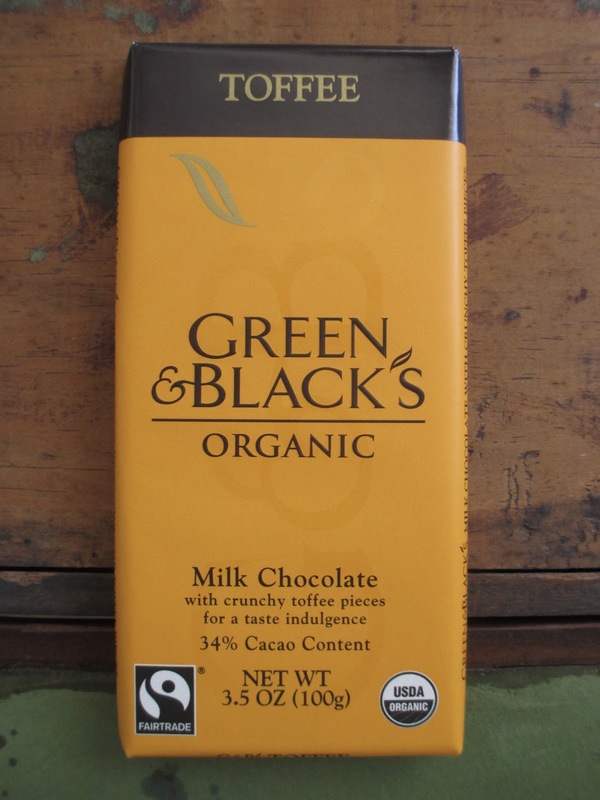 Before there were so many fair trade chocolates to choose from, Green & Black's was there to provide that option. So they let the consumer decide if this is fancy chocolate or casual chocolate--and all they tell you is that it's a good product. I'm labeling it as a confection, but to you it might be something different. And I suppose that works. As I keep stressing, while artisan chocolate is absolutely wonderful, we don't need all fair trade chocolate to be in that style. So if Green & Black's is one of the companies that offers some of the more casual options, then I am supportive of that.